County residents will be learning how they can protect themselves and loved ones this upcoming week. Fire Prevention Week begins on Sunday and will continue through October 13. Through the week, officials are hoping to teach county residents three safety tips — look for fire hazards, listen for a smoke alarm, and learn how to escape from a building that’s on fire. Families should make sure doors and windows aren’t blocked and select a place they can meet outside in case of a fire, according to a release from the Prince William County Department of Fire and Rescue (PWCDFR). They are also advised to practice fire drills at home and check smoke alarms once a month. “When a fire occurs in the home, smoke spreads quickly; smoke alarms provide an early warning allowing you time to escape a home fire,” the county’s Fire and Rescue Chief Kevin McGee said in a release. Events are being held throughout the county during Fire Prevention Week. The Dale City Volunteer Fire Department (DCVFD) is hosting an open house this weekend. During the open house, which will run from Noon to 4 p.m., participants will learn about fire safety and the role of firefighters. 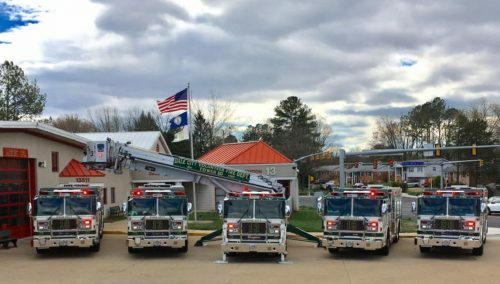 They will also receive a tour of trucks and rigs at the station, which is located at 3171 Prince William Parkway in Dale City. Saturday, 11 a.m. – 2 p.m.
October 13, 9 a.m. – 3 p.m.
October 13, 10 a.m. – 3 p.m.
October 13, Noon – 3 p.m.
October 13, 10 a.m. – 2 p.m.
October 27, 10 a.m. – 2 p.m.
More information about Fire Prevention Week is available on the National Fire Protection Association website.